Now The Question: Super Sports or A/S 3's? Low tire pressure came on as I rolled out of the parking lot at work this afternoon. Pull to a gas station, notice my right rear was flat. I only live a few miles away so pumped it up and drove it home (where I could use my good jack rather than the crappy scissor jack). 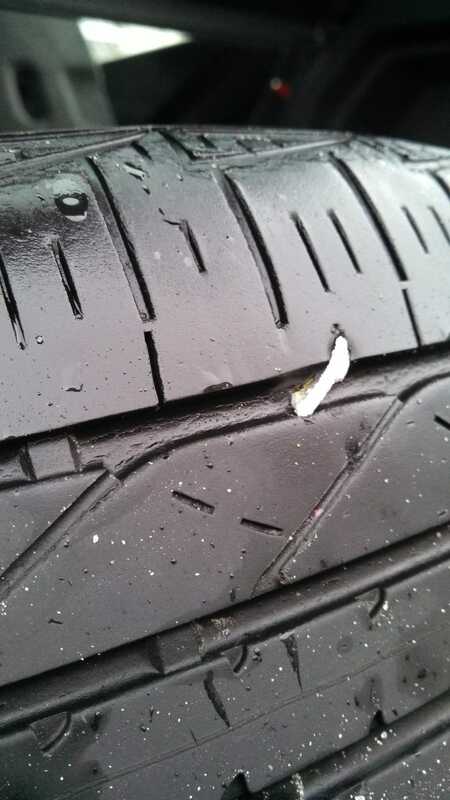 Found this in my tire. I plan to get it patched tomorrow (Thanks, Discount Tire! ), but these factory all seasons are getting tired. Planning to do wheel/tire upgrade soon anyways, so what say you? Pilot Super Sports or A/S 3's? I live in the southern areas of the country, where no one knows how to drive in the 1" (or 6" as of this winter) of snow they might get anyways so I'm thinking of new rims (17x7) and summer tires, then take my factory rims and have a set of Blizzaks mounted up on them (My parents live in WNY, and I drive home over Christmas, so they'll be handy. Also, that inch of snow that I mentioned wouldn't leave me scared).